Scratch 9: Cat of Nine Worlds TPB is coming! 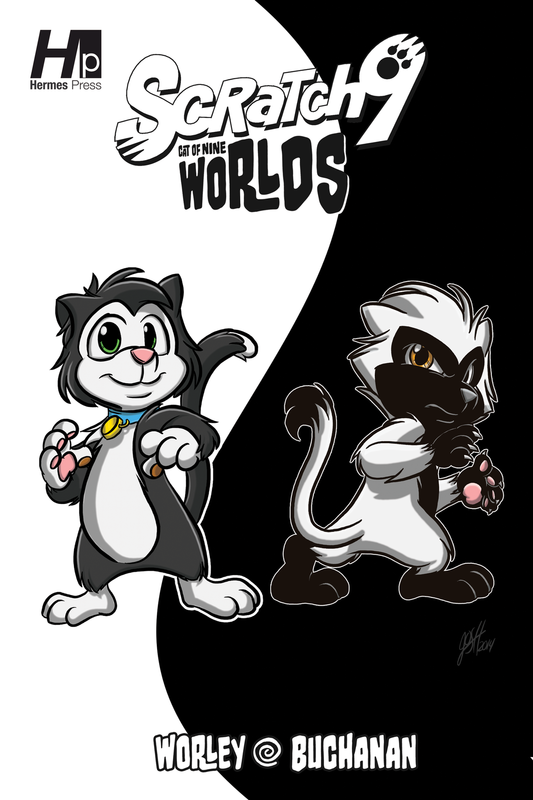 February 27, 2015 – Comics creator Rob M. Worley is pleased to announce the summer release of the epic graphic novel, “Scratch9: Cat of Nine Worlds,” from Hermes Press! The new volume is written by Worley with art by Joshua Buchanan (“The Rocket”, “Scratch9: Cat Tails”) and a foreword by Mike Kunkel (“Herobear and the Kid”). Critically acclaimed and Eisner-nominated, Scratch9 tells the tale of an ordinary house cat named Scratch caught in a mad scientist’s experiment gone wrong. Scratch gains the extraordinary ability to summon any of his nine lives to get himself out of a fix. In “Scratch9: Cat of Nine Worlds”, Scratch’s feline powers won’t help him against his evil opposite Strick. Aligned with the villainous Dr. Schrodinger, this cantankerous cat sends our hairball hero back in time to the ice age. Now Scratch must journey through history to claw his way back to his best girl, Penelope and make the world safe again! The book features over 170 pages of breath-stealing adventure. “We’ve been flooded with letters and fan art from young readers who picked up last year’s Free Comic Book Day edition. They’ve been waiting patiently for the rest of the story. Well, the wait is over,” Worley said. The story is supported by a fantastic gallery of artwork from the series’ cover artists: Kevin Eastman (“Teenage Mutant Ninja Turtles”), Mike Kunkel, Jay Fosgitt (“Bodie Troll”), Jenny Parks (Marvel Cat Variant Covers), Francesco Francavilla (“Afterlife With Archie”) and Rafael Albuquerque (“Ei8ht”). “Scratch9: Cat of Nine Worlds” TPB is available for pre-order from the March Diamond Previews catalog (ordering code #MAR15 1391). The book ships in June. As with all Scratch9 products, a portion of the proceeds will go to the S.W.A.H. fund, benefiting animal shelters across the country.